BETTER THAN NEW ON LARGE LOT! 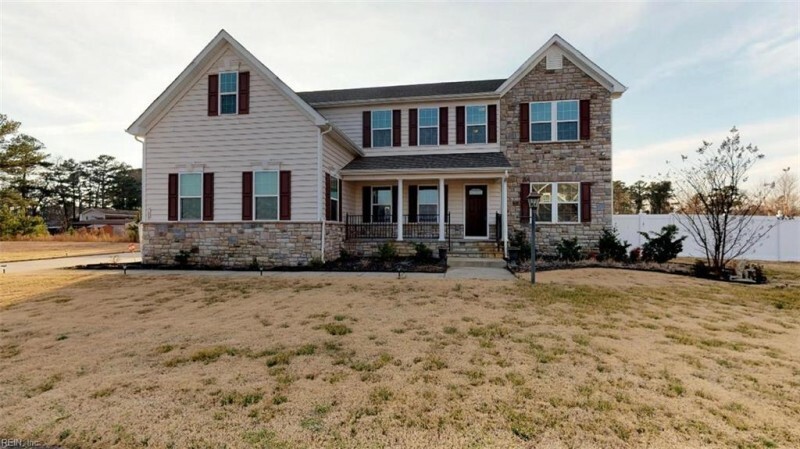 THIS TRANSITIONAL 2 STORY HOME FEATURES BEAUTIFUL STONE ACCENTS, 5 BEDROOM, 3BTH, 3 CAR SIDE LOADING GARAGE. 1ST FLOOR BEDROOM WITH PRIVATE BATHROOM, LIVING ROOM, DINING ROOM, FAMILY ROOM WITH GAS FP. LARGE KITCHEN WITH OVERSIZED BREAKFAST AREA, GRANITE COUNTERTOPS, CERAMIC BACKSPLASH, TOP OF THE LINE GE APPLIANCES, GAS COOKING, DOUBLE OVENS AND WALK-IN PANTRY WITH LOTS OF CABINET/COUNTER SPACE. LARGE MASTER BEDROOM WITH TRAY CEILINGS, WALK IN CLOSET, MASTER BATH WITH OVERSIZED GARDEN TUB, STAND UP SHOWER, WATER CLOSET. NICE LARGE MAINTENANCE FREE TREKS DECKING AND VINYL PRIVACY FENCE AND STORAGE SHED. WASHER/DRYER ON SECOND FLOOR WITH UTILITY SINK. BUILT IN SECURITY SYSTEM, IN WALL SURROUND SOUND IN FR,MEDIA CLOSET, WELL PUMP AND 7 ZONE SPRINKLER SYSTEM. Ready to visit 700 Appalachian? Request a free property tour! Send me more information about the listing at 700 Appalachian, Chesapeake, VA 23320, MLS# 10240029. This 5 bedroom, 3 bathroom home located at 700 Appalachian, Chesapeake, VA 23320 has approximately 3,406 square feet. It is currently listed for $489,900 and has a price per sqft of $14,383. This home is currently Active under the MLS#: 10240029. This listing is provided by Better Homes&Gardens R.E. Native American Grp. 700 Appalachian Court, Chesapeake was built in 2014. It has Garage Att 3+ Car, Off Street, Driveway Spc parking.The kitchen includes Dishwasher, Disposal, Energy Star Appliance(s), Elec Range. 700 Appalachian is part of the All Others Area 32 neighborhood located in 23320.